Unfortunately, the Aluspray is not available for sale anymore. Please have a look at Dechra Aluminium Spray for a suitable alternative. Aluspray is the abbreviation for Aluminium spray. This specialist spray adds a protective layer around open wounds. It also ensures that the wound remains air permeable. In other words, it stops bacteria or dirt from reaching the wound whilst still allowing it to breathe. Aluspray can be used on all kinds of wounds and because they are kept clean, they heal faster and will be less likely to scar. Aluspray leaves a fine mist of aluminium on the surface of the wound, resulting in a layer of protection against dirt and insects. Cattle, horses, pigs, birds, sheep, dogs and cats. 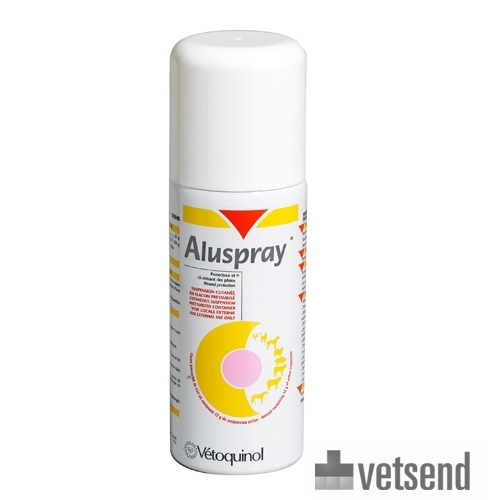 Aluspray can be safely used on pregnant animals. Animals with hypersensitivity to the active ingredients. Animals with severe kidney disorders. Injuries on lactating animals producing milk for human consumption. Shake Aluspray well before use. Apply the spray 1-2 times a day on the superficial wound. For optimal use, the wound should be cleaned, disinfected and, if necessary, stitched before the spray is applied. Aluspray is contained in a 210 ml spray can so that the wound does not have to be touched. Liquid paraffin 12.0%, liquid petroleum gas 84.0%. Store the spray in a cool, dark place. Keep it out of direct sunlight and temperatures above 25 degrees. Have you used Aluspray before? Let us know what you think about this product. Does what it says on the tin...!!! It does what it says and that's why I buy it...!! A fantastic must have product to have if you own a horse. Great product at a good price. Very quick delivery, with good information from the courier. Will use again and highly recommend. Excellent for protecting wounds where the horse won't let you get at the wound to put a conventional dressing on.